"My mom gave me this recipe for Thanksgiving. The family and I loved it. We had never liked sweet potatoes before! This colorful, aromatic side dish cooks in the microwave in minutes"
In a large bowl, mix together sweet potatoes, apple pie filling, brown sugar and cinnamon. Transfer to a medium microwave-safe dish. Microwave on high 5 minutes, or until the mixture is hot and bubbly. Threw this straight into the trash can! This should NEVER happen to a sweet potato! Terrible texture contrast and taste contrast. This was really good. I wasn't sure if the sweet potatoes were supposed to be drained, so I left about 1/2 the juice and it turned out good. Thanks! Wow! I needed something quick tonight and had these ingredients on hand. We LOVED it! A keeper. 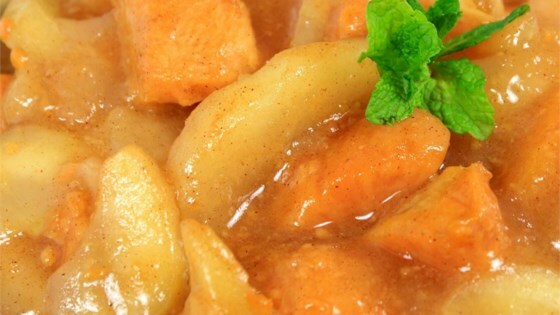 The combination of the apples and sweet potatoes was wonderful! My kids and my boyfriend enjoyed it and it was soooo easy! My husband loved this one. I will make sure to drain the sweet potatoes next time, I think that will bring out even more flavors. Thanks!